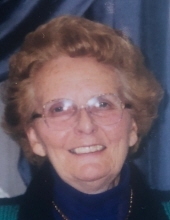 FLAHERTY, MARYANN (Keady) of Norfolk formerly of East Walpole passed away on March 16, 2019 at the age of 89. Maryann was born in Spiddal, County Galway, Ireland. She was the beloved wife of the late Michael Flaherty. Loving sister of Edward Feeney of Dorchester, Kathleen Keady of Belmont and the late James Keady, Ann Keady, Bridie Keady and Patrick Feeney. Also survived by many nieces and nephews. Maryann was a member of the Norwood Irish Club and a former Volunteer for the Pine St. Inn. She was also a longtime worker for the SMA Fathers in Dedham for many years. Funeral from the Kraw-Kornack Funeral Home 1248 Washington St. Norwood, Thursday, March 21, 2019 at 9am followed by a funeral mass at 10am at St. Mary’s Church East Walpole, MA. Visiting hours will be held on Wednesday, March 20, 2019 from 4-8pm. Burial will be at St. Francis Cemetery Walpole, MA. In lieu of flowers donations may be made in her name to the Alzheimer’s Association 309 Waverley Oaks Road, Waltham, MA 02452. To plant a tree in memory of Maryann (Keady) Flaherty, please visit our Tribute Store. "Email Address" would like to share the life celebration of Maryann (Keady) Flaherty. Click on the "link" to go to share a favorite memory or leave a condolence message for the family.